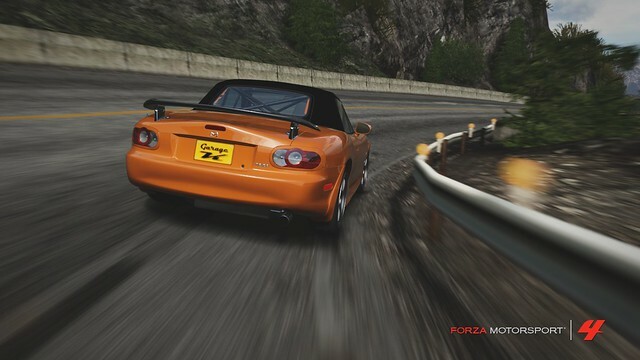 After making a dash at the start line, take a line that is wide enough so that you can go full throttle without slipping the tires while cutting across to the left (aim for the dirt patch on the side of the road, try to keep you inside tires to the left of the white line when cornering). There is no real braking point here so just use your judgement. 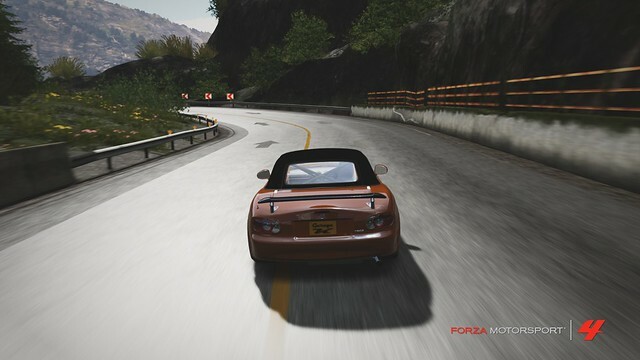 Slow down just enough so that the front tires don't understeer when turning into this steep slope. 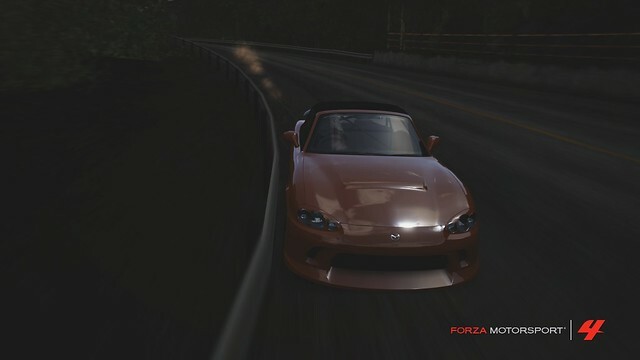 Notice the kink in the guardrail, this will be your apex. Since the corner is banked, you should be able to clear it (once you have steered into it) by letting off the throttle and gassing it at the exit. Keep the car straight because you need to set yourself up for the next corner. 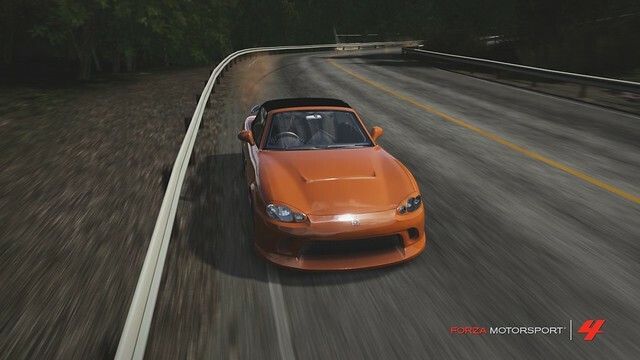 This is a low speed, off-camber, double-apex corner. Dash in at this angle, there is no need to come in from a wider line. The first apex is the kink in the rock wall. Keep the car in the same gear you entered with (generally 2nd gear). Do not cross over into the outer lane. 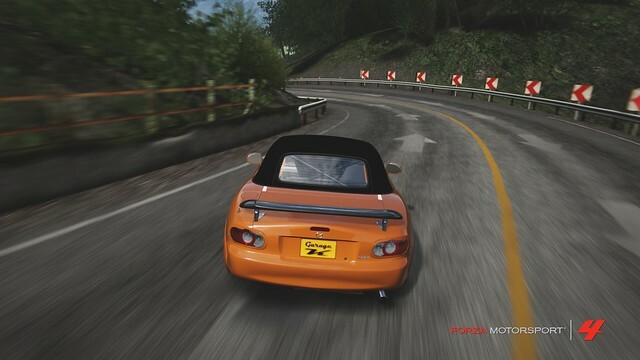 Keep the car to the left of the yellow line and steer into the second apex. Run next to the rock wall, keep the inside tires on the dirt patch and ride it nice and tight all the way to the exit. At the exit you should be in the left lane, cut across to the right and aim for the kink in the guardrail, you should be either off the throttle or half-throttling here. 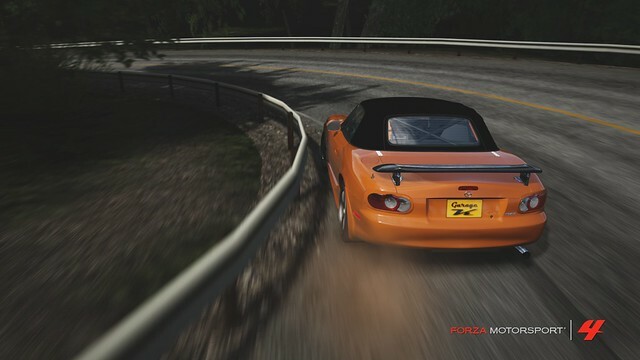 The closer you get to this apex the better (try getting even closer than this). Also, notice that there is an elevation change (the exit is in a slight uphill slope). 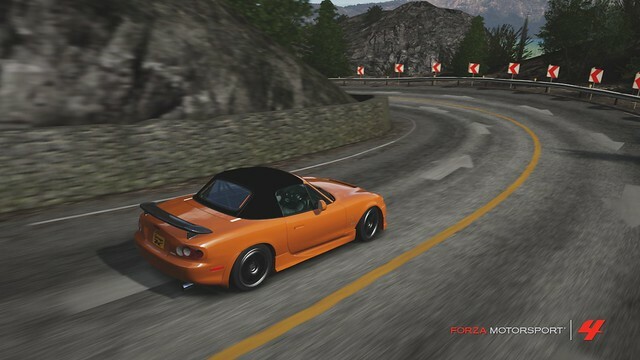 Use this to your advantage and gas it at the exit, the slope (as well as the sudden acceleration) will help shift some of the weight to the rear giving you enough traction to exit this corner at full throttle with little to no traction problems. Keep the car to the right or at least the middle because you need to come in wide for this next corner. Aim for the white line over the dirt patch or the wall in general but try not to hit it though! 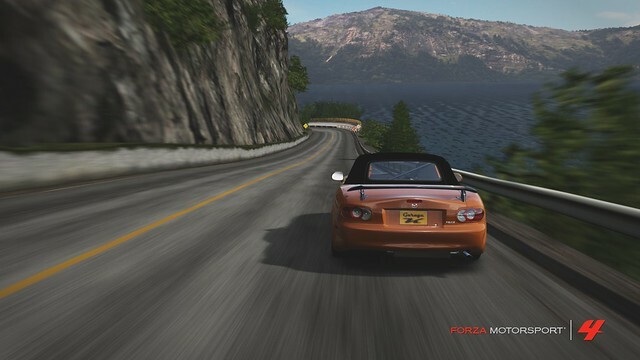 Beware of the slight downhill slope here also because it can throw the car off-balance. This corner and the next one should be treated as one big S-curve. 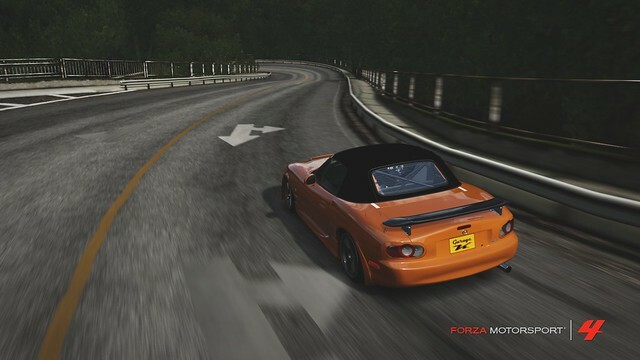 The reason being that if you run wide at the exit of this corner, you will be at a bad angle for the second, so try to link these two corners together and make the car flow steadily through them with no major weight shifts. Notice the white line on the road, it's a good idea to stay close to it, if not over it, when taking this corner. Remember that your exit should set you up for the entry into the next corner. 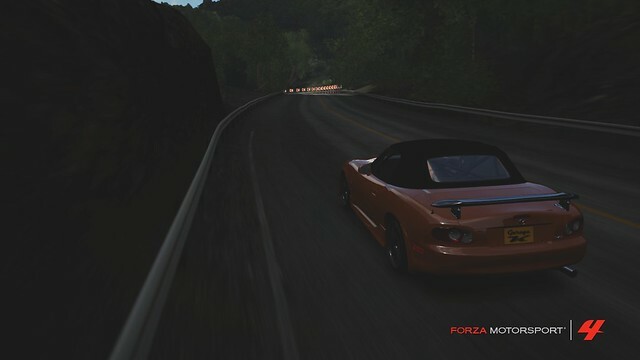 You should be cutting across from the left lane into this apex. 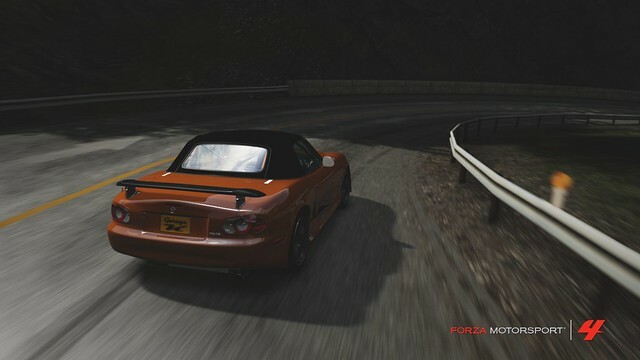 Ride next to the guardrail through this corner, take it as tight as you can. 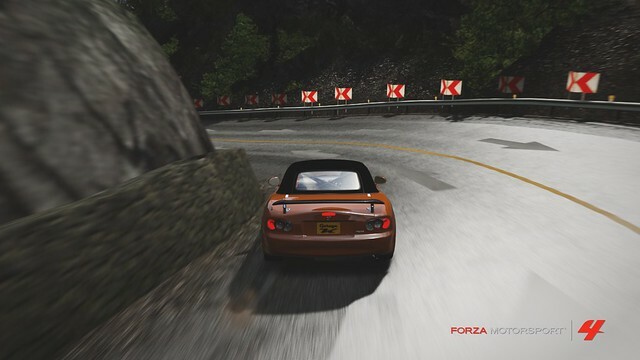 Exit this corner at full throttle while steering to the right because chances are you oversped into the corner and are on a collision course with the wall bend ahead! If not, keep the car straight. 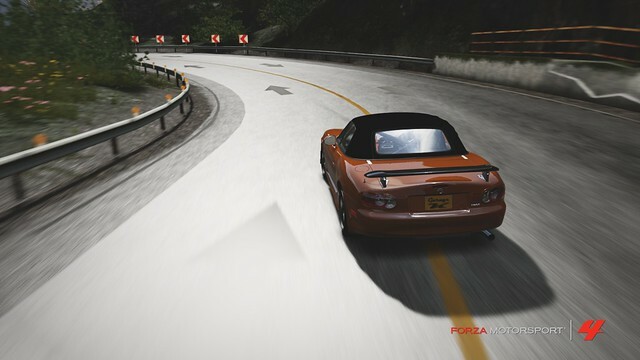 Draw a straight line from the exit of the previous corner to the entry of the corner up ahead and go for it. Just barely pass by the wall bend without hitting it. There is no need to swerve around this wall if you exited from the last corner properly. Keep a tight line through this corner (preferably on the right side of the right lane). However, DO NOT run right next to the inner mossy wall, you can get as close to having the inner tires on the dirt patch but that's about it. This is about as close as you can get to the inside without crashing. It's better to draw out a wider line than to risk getting this close during a race. In fact, I ran so close to the rock that both of my inside tires lifted off the ground! If I had come even 1cm closer I would have crashed for sure! Depending on how wide you exit, there are THREE ways to take this next corner: NARROW, MEDIUM, or WIDE. 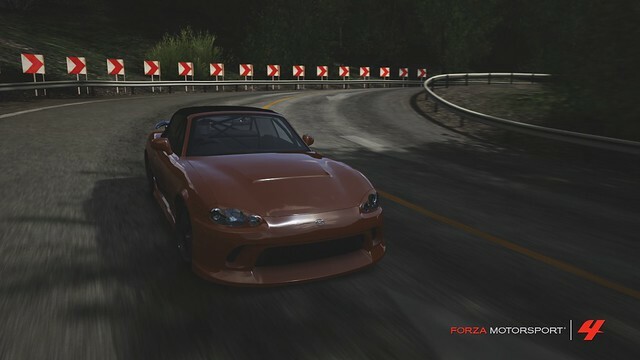 You can take the narrow approach by exiting on the left lane and running a tight line next to the inner guardrail (early apex, best entry, worst exit). You can take the medium approach by exiting on the middle of the road (normal apex, medium entry, medium exit). And finally you can take the wide approach (late apex, worst entry, best exit). It is up to you to decide for yourself which of these lines is best for you (or best benefits you during a race). I prefer the medium approach. It doesn't give enough space on the inside to be overtaken and it doesn't sacrifice too much speed for the exit. 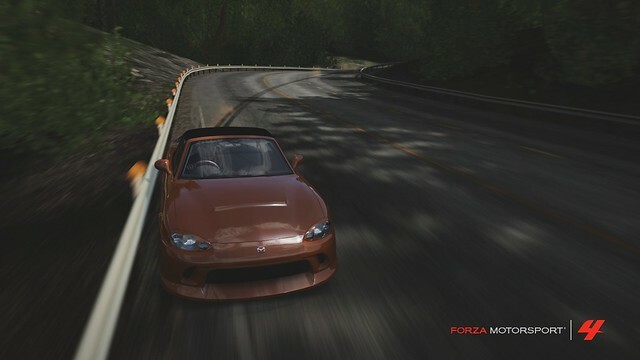 If you like this approach, cut in from the yellow line and steer the car in closer and closer to the guardrail until you hit the apex (about 3/4 into the corner). 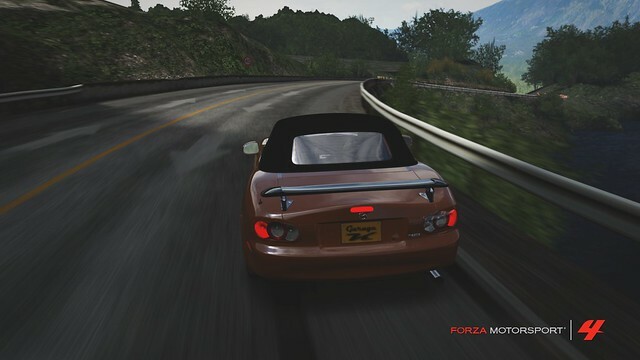 This corner does not require to be off the throttle (half-throttle should suffice). 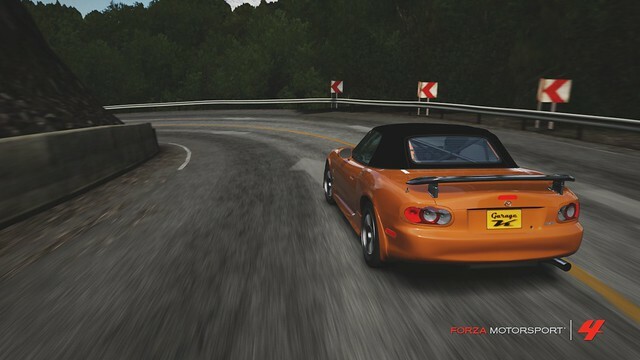 Since the exit leads directly into the longest straight on Fujimi Kaido, it is imperative that you nail this corner as best as possible. The exit is trickier than it appears (notice the elevation change). Since you are ready to go full throttle once the car lines up with the exit, the tricky thing becomes the timing. 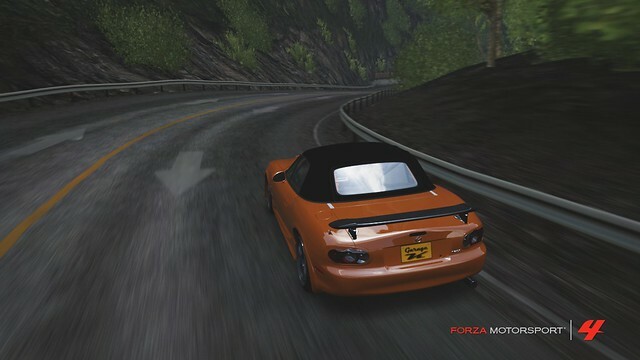 You should gas it the moment the car climbs over the crest, before it begins to descend over the slope. The slight climb will compress the suspension and give the tires extra traction for the exit. 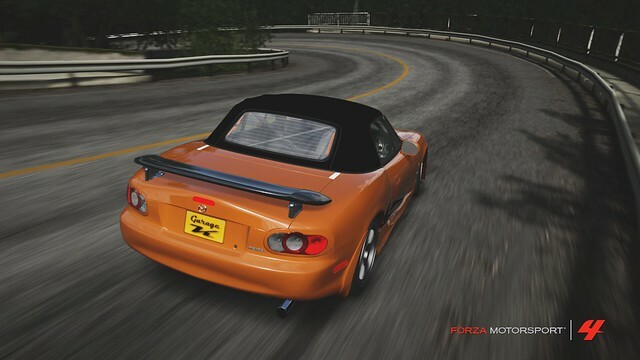 Gassing it later than that runs the risk of losing traction because the suspension will be expanding as it descends down the crest, thus giving the tires very low grip on the road. 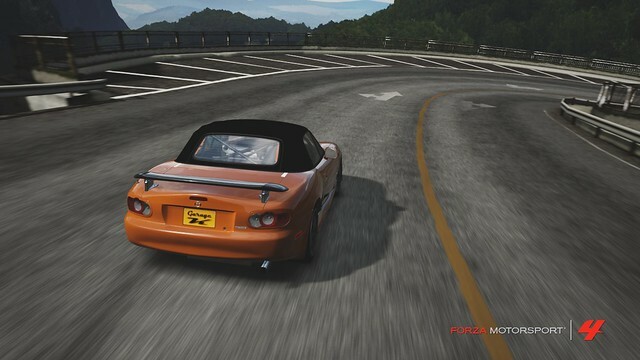 If you can align the nose of your car with the exit you should gas it as soon as possible! 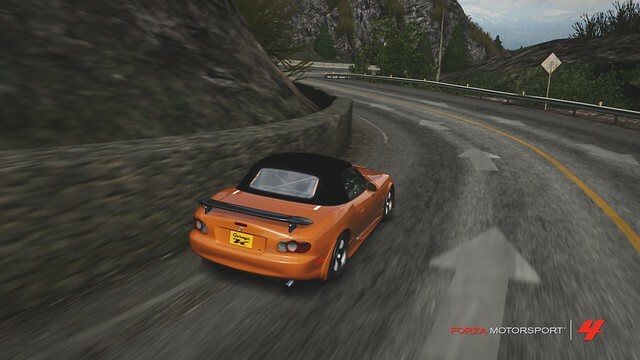 Exit the corner at full throttle and get as close to the outside guardrail as possible (keep turning to the left in case the car is understeering so that you don't hit the guardrail by accident). 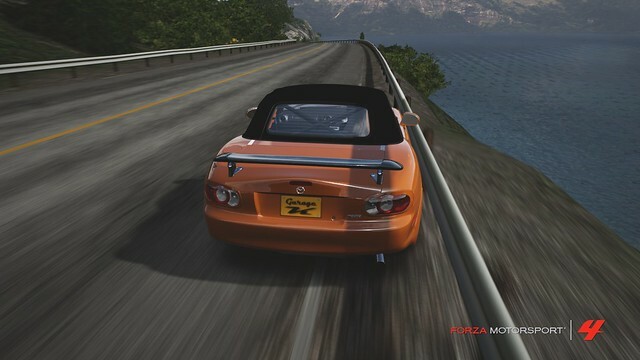 If you hit the guardrail you will lose a lot of speed for this straight (speed that you cannot afford to lose). 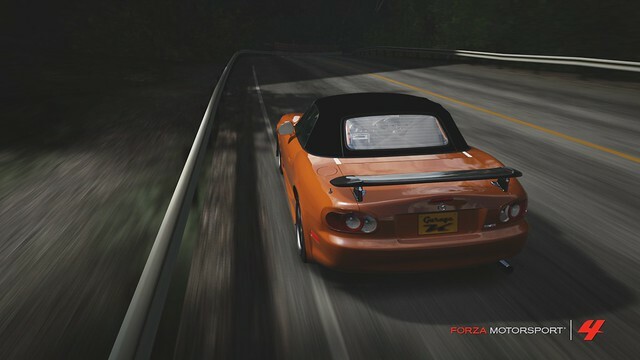 Remember, the key is to maximize your exit speed and use as much road as possible with whatever approach you had chosen. After travelling down the straight, veer into the right lane and prepare yourself. 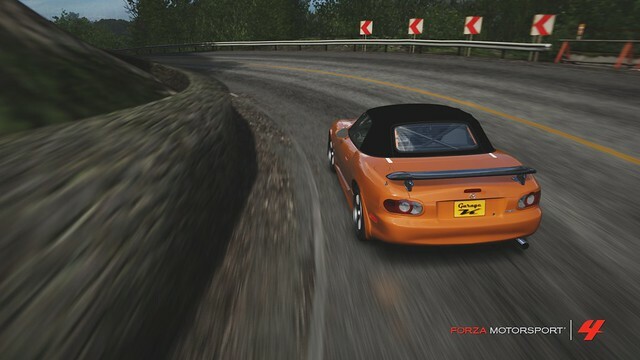 You should be approaching this corner at 130mph! 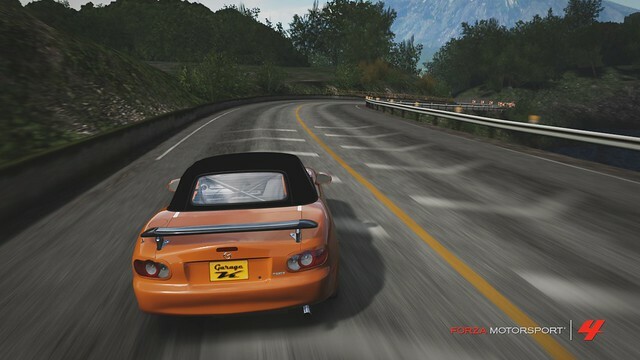 If there is any instance on Fujimi Kaido where two drivers would enter themselves into a braking battle... THIS IS IT. Use the shadow of the tree as your braking point. 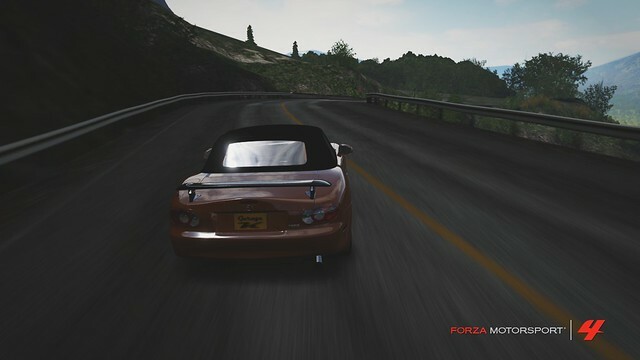 In my experience, if you're really good at braking, you can brake just AFTER the shadow. 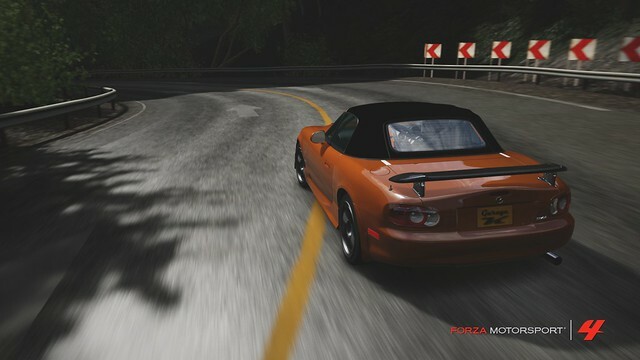 Remember that the shadow is only a reference, practice with your car to find out just how late you can brake for this corner at full speed. This corner should be treated as a late double-apex corner since it doesn't have a real apex in the middle. 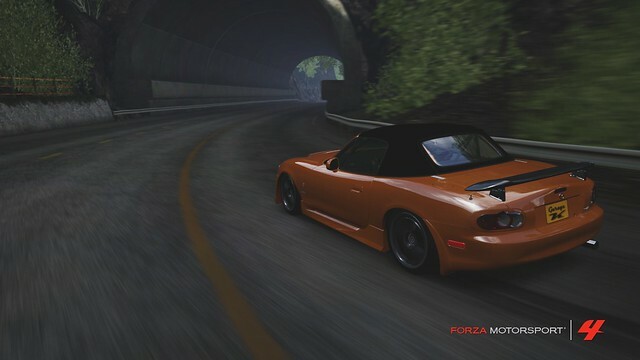 Dash in at this angle while still on the brakes (practice trail-braking into this corner since a mess-up here will cost you dearly). There is no need to clip this first apex since cutting in too close here will not set you up right for the second apex. 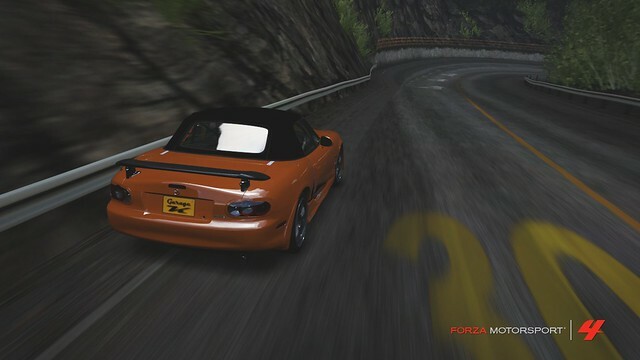 Instead, just focus on keeping the car steady and aim for it only in an overtaking situation. While keeping a constant yaw rate, continue steering into the corner as you approach the second apex. Keep the car on the inside lane (try not to cross over the yellow line). You should have slowed down enough by now to be able to half-throttle the gas at this point. 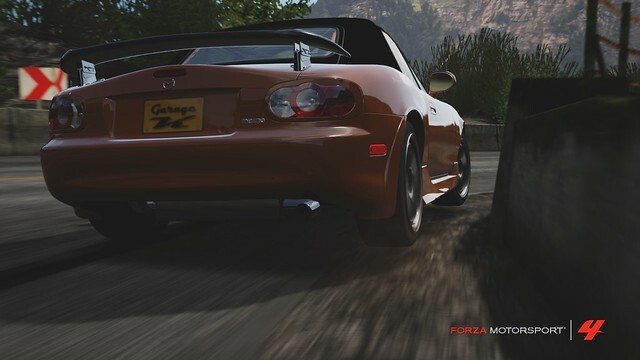 If you can, aim the car so that your inside tires ride over the dirt patch (try to get closer than this), this should give you enough space for a full throttle exit. Hitting this apex and getting the exit right is crucial for a fast lap time. Gas it at the exit. 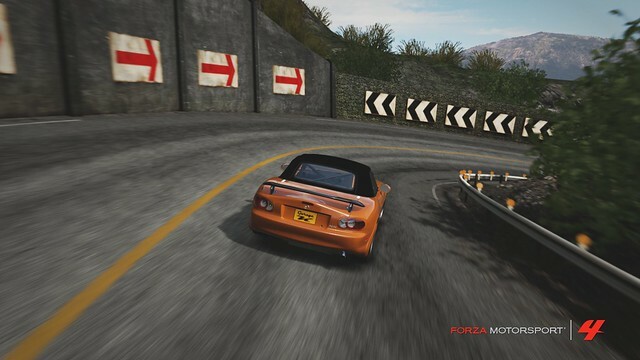 Use your throttle control skills to angle the car so that it ends up parallel to the guardrail at the exit (get as close as you can!). Remember that you want to use as much space as you can and maximize your exit speed. It may not seem like much, but if you stick to the outside guardrail for too long you will get to meet the Invisible Rock's little brother. This stump can ruin any unsuspecting driver's lap, it's just like hitting a curb, you WILL damage your car and you WILL ruin your lap, so avoid this by simply veering around it. Cut across to the left and set yourself up for this next corner. This corner is one of the trickiest because it is a high-speed, off-camber, double-apex corner. If you want to picture the line you are supposed to take here, think of it as an "inside-outside-inside" line. 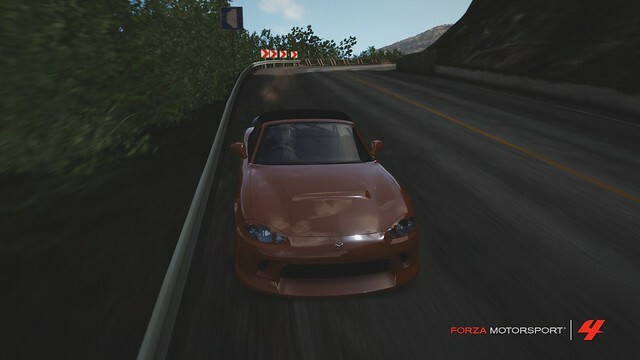 Begin by turning into the right lane while aiming for the kink in the guardrail, that will be your first apex. 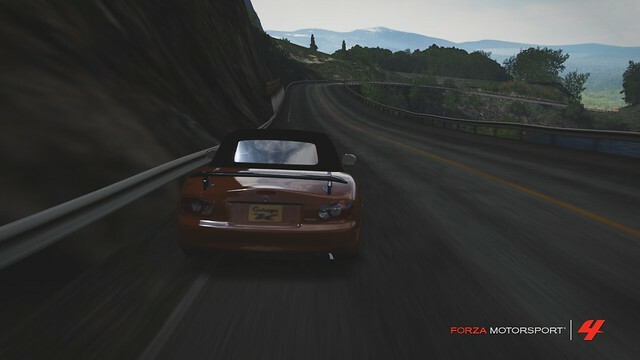 You can brake very late into this corner but take notice of the elevation change. Be sure to trail-brake while you are still climbing over this slope, the suspension will be compressing and the tires will have maximum grip. 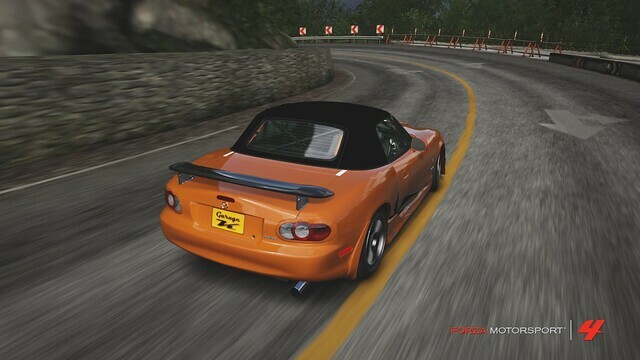 If you brake any later, the suspension will begin to expand the moment the car starts to descend down the crest and any grip on your tires will be reduced, so much so that you will probably crash into the outer wall due to over-braking. As I said before, continue braking and steering into the corner. 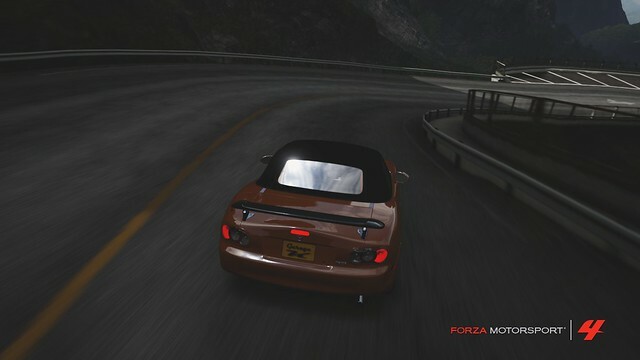 At the apex, the car will begin to slide outwards. This is because the reverse banking on the corner reduces the grip on the tires, causing either understeer or oversteer depending on the car. 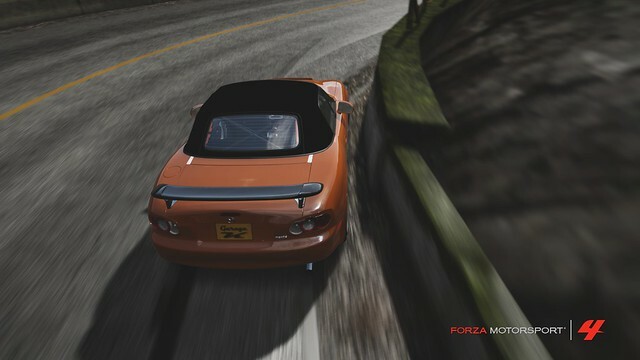 Don't fight this, instead, allow the car to slide to the outside while keeping the car at an angle that will set you up for the second apex. 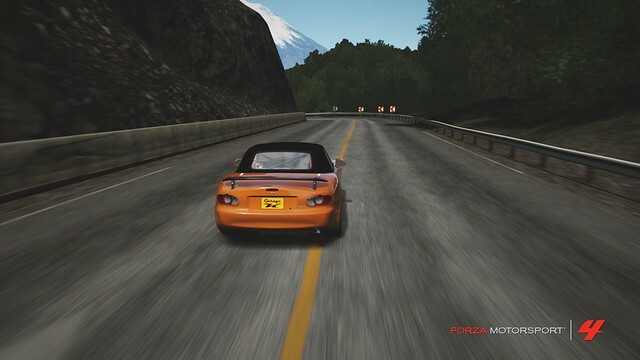 While still turning the wheels and angling the car, try to regain traction on your tires. At this point, you should have sped in fast enough so that you end up on the left lane mid-corner. There is no need to go any wider than this. If you end up further out, you risk hitting the outside wall or missing the ideal turning point for the second apex. During this phase, it is best to be either off the throttle completely or half-throttling the gas in order to maintain an angle. You want full grip and no traction loss here. 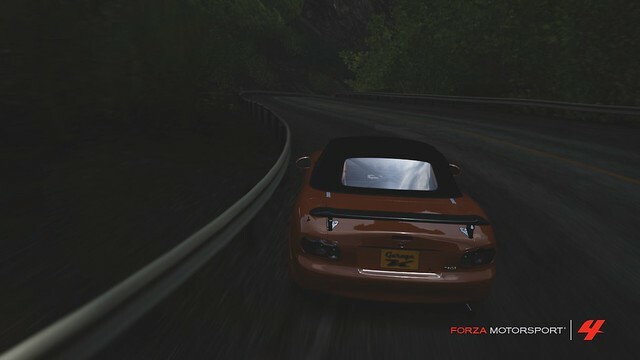 Your goal at this point, no matter what technique you use, is to steer into this apex as close as you can without losing too much speed while on a reverse bank at near 80mph. The exit of the corner is just as tricky as the entry was. As you can see, the entry into this next corner is JUST after the exit so you will need to link this exit with that entry together in order to successfully weave through this S-curve. The secret here is to keep your steering movements to a minimum. It may sound simple, but at 65+mph with a sharp corner up ahead, it's anything but. For starters, don't go too wide here (it would be impossible to turn into this next corner without slamming on the brakes if you end up on the left lane). 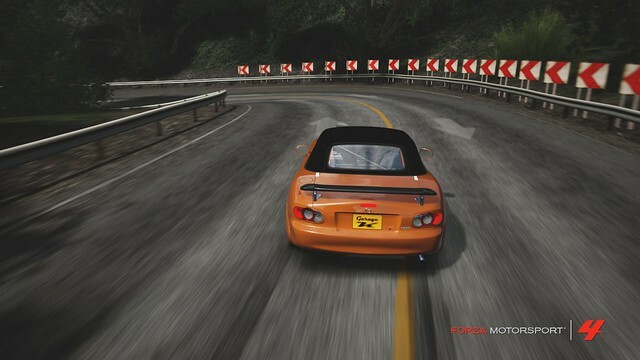 Try to keep the car from crossing over the yellow line. 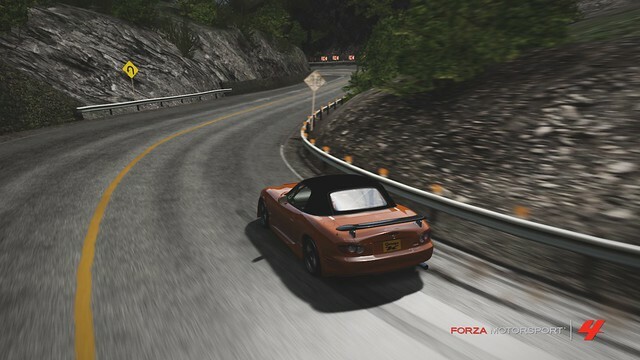 Expert drivers are able to stay on the gas and clear this section full throttle by using very precise lines. Your speed into and out of these corners depend heavily on the line that you take. This section is one of the most difficult in Kaido because of this corner right here. Nailing this corner requires precision and practice so don't feel bad if you fail your first couple of attempts. In order to successfully exit this corner at full speed, you need make sure that the car is on the right of the yellow line when you turn in. It will not work from the left lane because it's too close, and, ironically, it will not work out from the right lane either because it's too far out to steer into the apex at this point, so you need to find the sweet spot in between. Try not to tap the brakes here since that will ruin your rhythm but it is important to control your speed, too fast or too slow is equally bad. 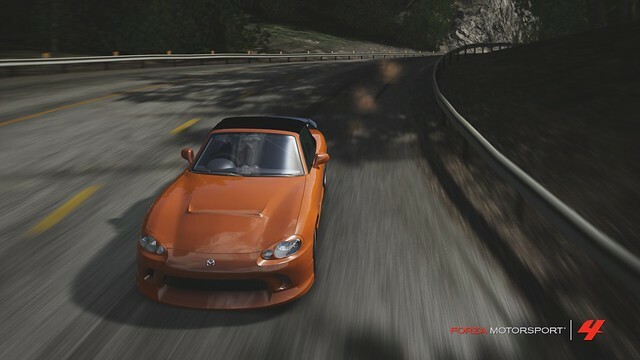 Notice how the turning point is early, it may look like you're on a collision course with the guardrail but this line will allow you to hit the apex. If done correctly, your car should be about 1cm away from the guardrail, nailing the apex perfectly, and exiting the corner at full speed! The entire motion should look as smooth and simple as possible. No drifting, no drama, the only thing needed here is careful and delicate maneuvering. Simple movements are sometimes the hardest to perfect, which is why delicate corners like this can separate the pros from the amateurs. Again, the last thing you want to do is mess up this section, it will seriously ruin your lap time. 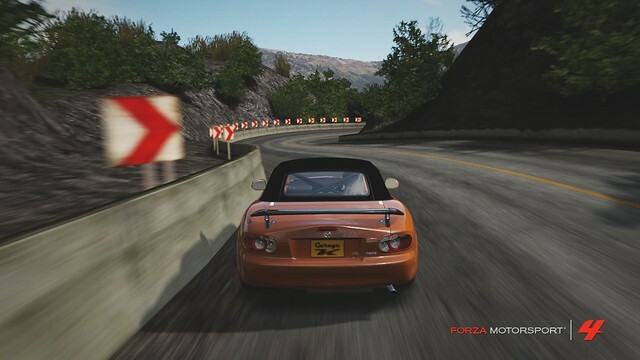 The guardrail on the exit is curved, meaning that you can approach the guardrail even closer if you rotate the car a bit to the right (to avoid hitting it). Doing so will help you clear the exit without banging your right rear-quarter panel on the guardrail. Do this by simply letting off the gas momentarily (to regain traction at the front) while steering gently to the right (to rotate the car). 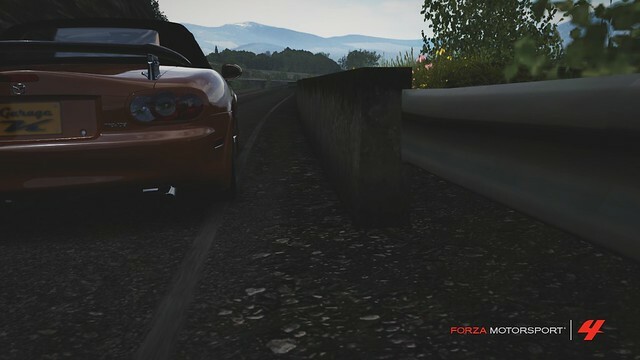 Note that the further away you are from this guardrail on the exit, the better (and faster) you will be able to clear this next corner. 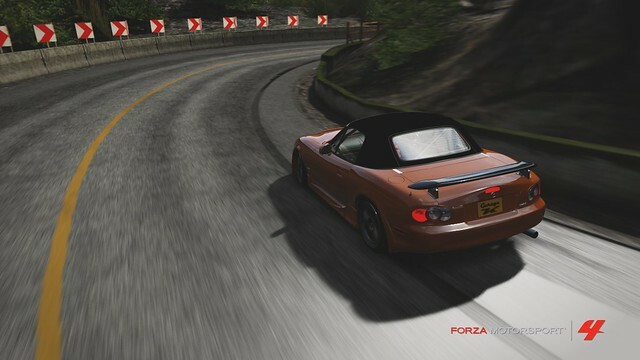 This is a long, sweeping corner that combines high speed with a steep slope. It is not difficult but it IS easy to overspeed and crash so be careful. Taking an out-in-out line is ideal here. If you kept your speed up, you should be right next to the guardrail on the left lane, approaching this tight left-hander. 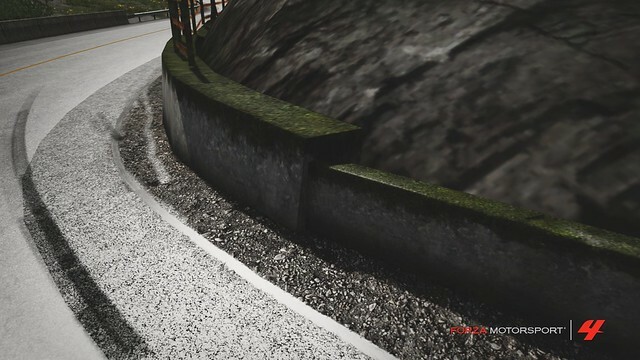 Since this corner is akin to a hairpin, it doesn't really matter at what angle you enter this corner as long as you hit the apex. Some people like to turn in from the yellow line, others (like me) prefer to just take it tight on the inside lane (a wide approach to this corner should actually be discouraged since you'll just be wasting time by slowing down excessively to take a line like that). Nice and tight should be the motto here, no need to use more road than absolutely necessary. You may or may not think of the previous corner as a double-apex, but it really is. On the exit, do not step on the gas until your car is pointing towards this kink here. Once it is, get as close as you can while applying as much throttle as you can. The corner up ahead is a simple right-hander so keep the car straight and try braking as late as possible. There is more than one way to execute this corner but you can't go wrong with a middle approach from the yellow line. However, too tight or too wide can slow you down so keep the car gripping properly. This brief straight is a good place to rob your opponent of his inside line. If you're close enough to do so, GO FOR IT! If not, stay on the yellow line and prepare to brake as late as you can. 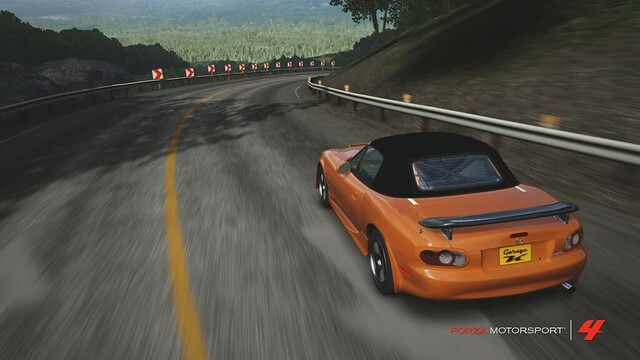 This corner is a wide left-hand hairpin and, in my opinion, one of the funnest corners on Fujimi Kaido (considering it is completely blind!). Taking it wide is a good way to ruin your lap so remember to stay on your line and keep it tight on the inside (do not let your car understeer to the outside!). Keep your inside tires over the dirt patch on the inside and stay there all the way to the exit. Also, if your opponent left enough space on the inside, you can overtake him (or at least get beside him) by taking a line as tight as this. Don't exit wide here because the next corner requires a wide line. 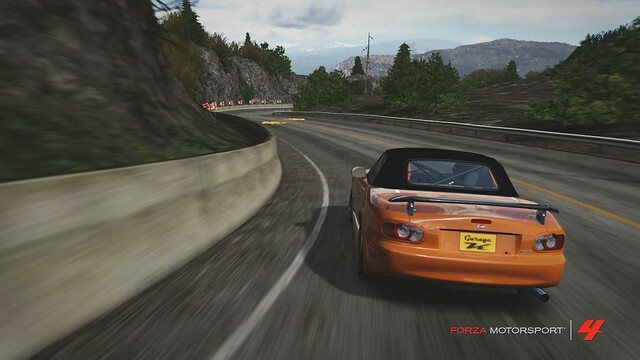 There is a brief space followed by a fast right-hander on the exit so prepare to cut across from the left lane towards the apex at speeds very close to full throttle. 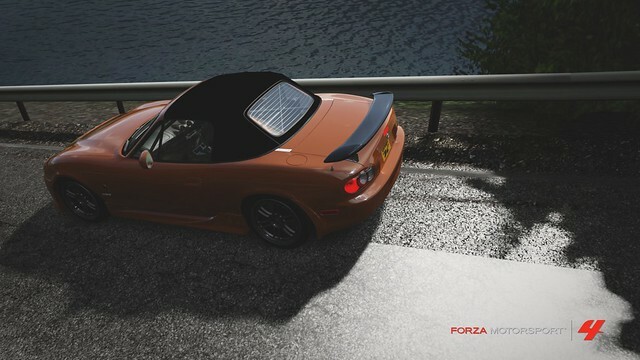 Draw out the widest line you can while still being able to clip the apex. Your goal is to end up parallel to the outside guardrail on the exit while carrying as much speed as you can so don't let off that gas pedal! 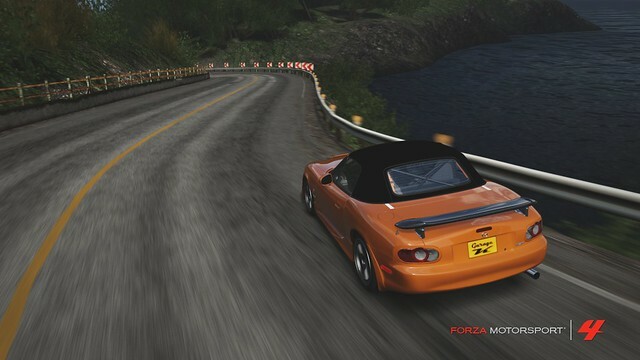 The closer you can get to the guardrail the more speed you can carry (Try to get closer than this!). At this point you should prepare to brake for the next corner. This corner is trickier than it appears. The main problem is conserving traction. 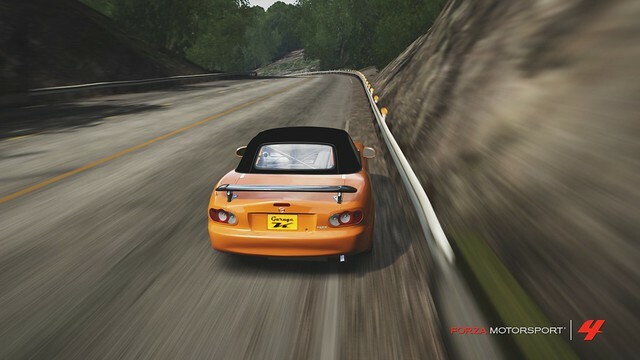 The slope of the road suddenly becomes steep and your high entry speed will make braking difficult. This corner is also a double-apex to make matters worse. First thing you should do is brake in a straight line. 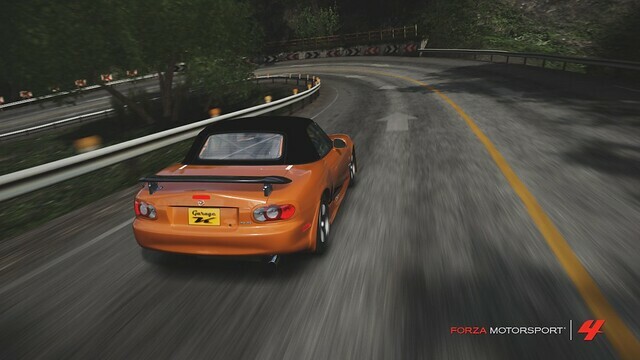 Some people prefer to use trail-braking here since the apexes are at the bottom of the slope and it's easier to slide the car there. 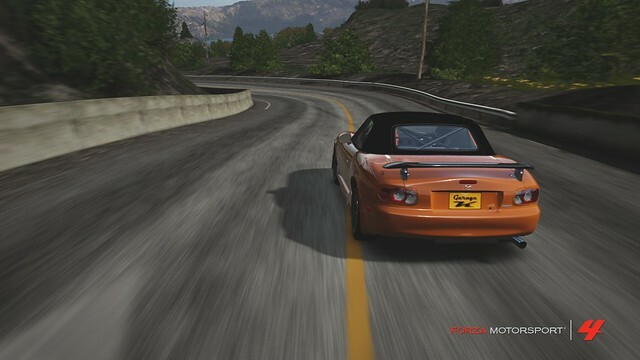 However, losing traction (be it understeer or oversteer) will cost you some time and can even give way to opponents behind to make a move and pass you. So keep your car straight and dive into "the waterfall". 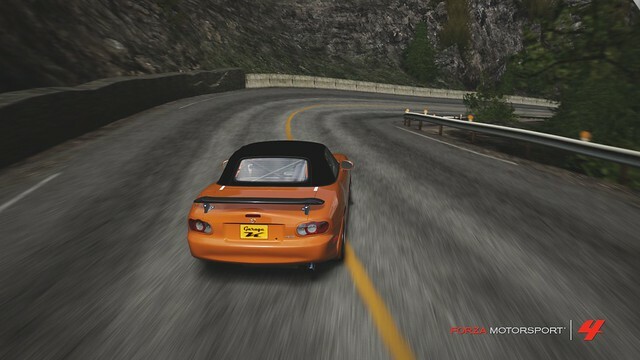 Aim for the first kink in the guardrail and be careful of locking up your brakes. You need an appropriate amount of entry speed to clear this section completely. Notice that the faster you go in, the further out you end up. You do not want to be too close to the inside (right lane) but you don't want to end up in the parking lot dirt either so practice what the limit of speed for your car is here. Again, keeping all four tires gripping is exactly what you want. 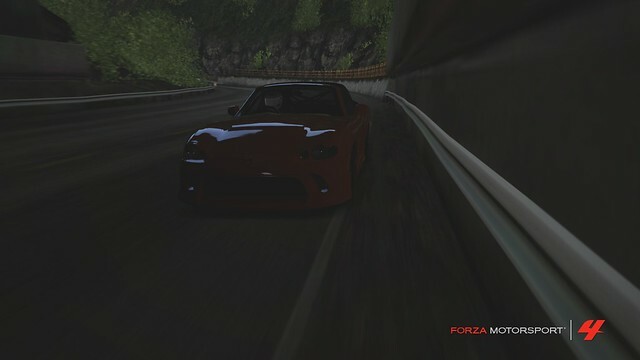 Notice the second kink in the guardrail, that is your exit apex. On the exit, you have a very brief period to mash the throttle and gun it. Up ahead is one of the slowest corners in the downhill (besides the hairpins). How to approach this upcoming left-hander is up to you. There are basically three approaches: Tight, Medium and Wide. 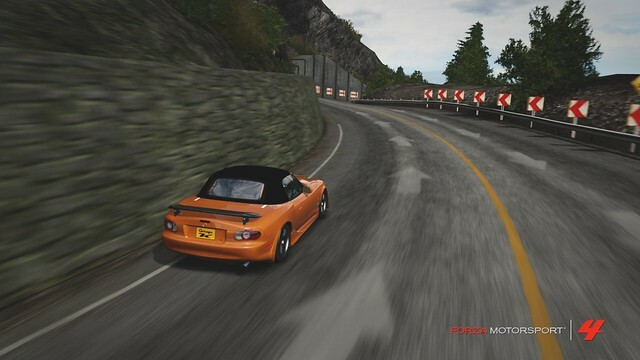 A tight approach implies exiting at full speed and ending up on the outside guardrail only to have to slow way down for the hairpin (fast entry, slow exit). A medium approach implies ending up on the yellow line and cornering normally (medium entry, medium exit). 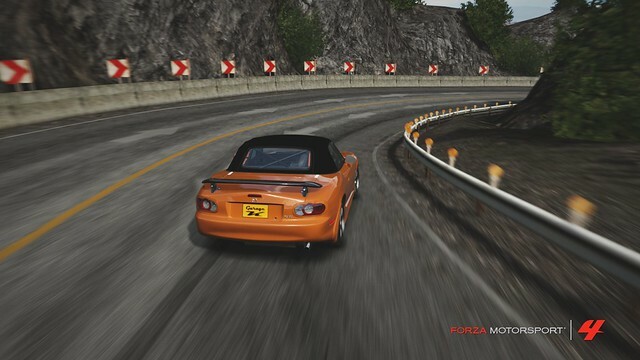 And a wide approach implies taking a tight line on the exit away from the outer guardrail and drawing out a wide line for the hairpin (slow entry, fast exit). I prefer the wide approach here. 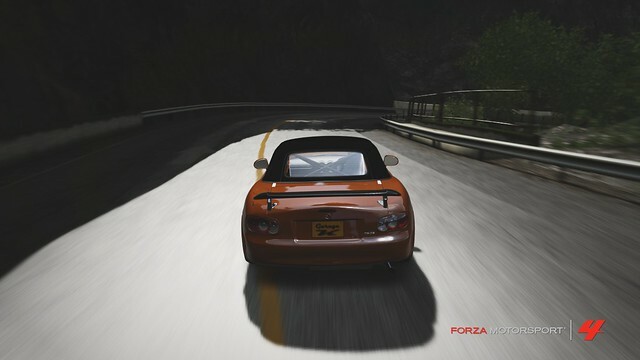 Brake slightly and steer in from the right lane, aim for a relatively late apex. 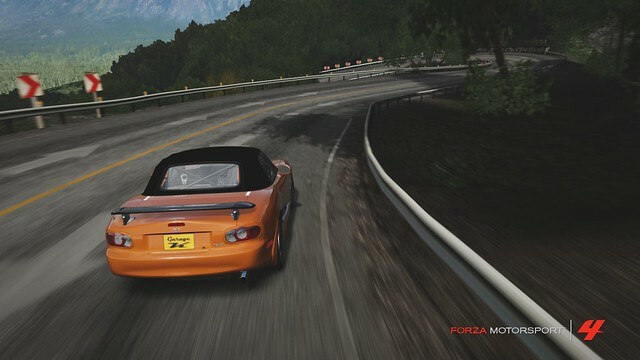 Cut in as close as you can to the apex and try to gas it as early as possible. 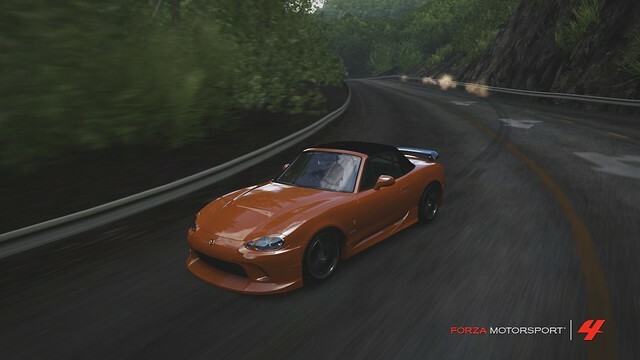 Use as much throttle as you can to shoot out of the corner, you don't want to waste what little momentum you have. This next corner is deceivingly difficult. The truth is you don't have to brake here, AT ALL, but your instincts tell you that if you do not tap the brakes you will overspeed into it and crash. The corner is steep and fast with no real braking point. Which means that your performance in this next corner relies on your guts and your skills at controlling your car's speed. 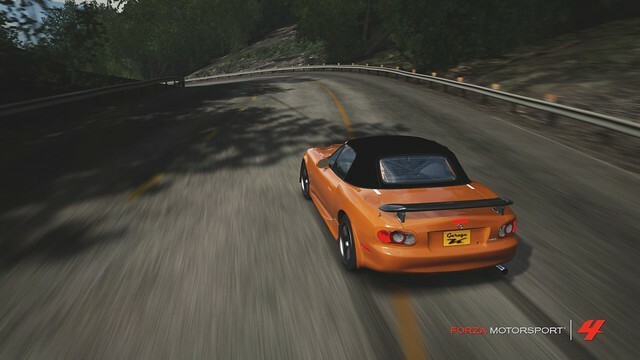 Once you begin crossing over the dark shadow line on the ground, ease a little off the throttle and steer into the slope (depending on how fast you exited the previous corner, a full throttle approach is possible too). The timing for steering into the corner is everything, too late or too early will both result in a ruined lap. 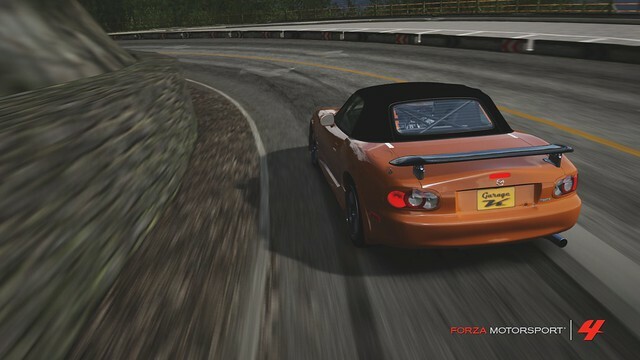 Since the corner is slightly banked, you basically want to dive into the inside guardrail and hug the apex. Once you get there (or even slightly before it) go full throttle! 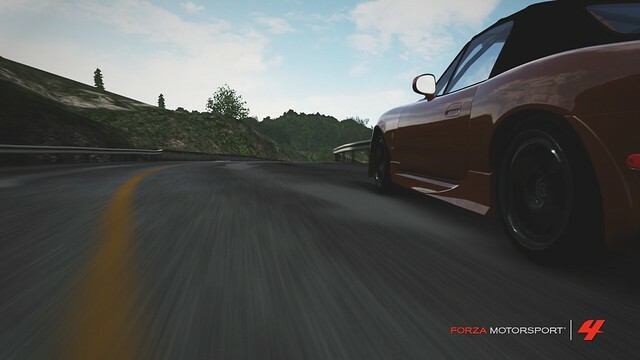 The slope levels off at the apex so the speed at which you're going should be high enough to compress your suspension and give you superb traction for the exit. Carry all the speed that you can and keep going. Notice how the guardrail on the exit is curved. You can use this to your advantage and extend your line even further out to maximize your speed. The next corner is a relatively low speed double-apex corner but its slope changes halfway from flat to steep. Pay attention because braking too late here will cause you to understeer to the outside. 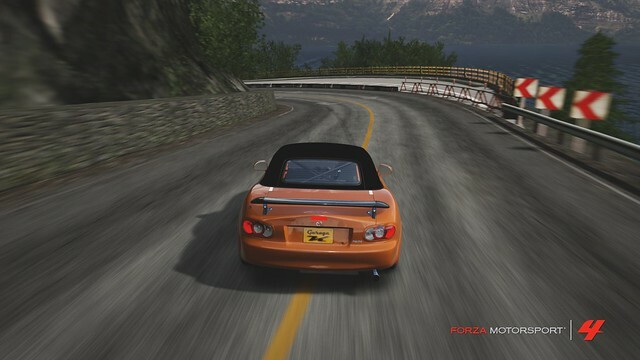 Aim your car behind the kink and beware of hitting your bumper or door on the apex. This corner is pretty technical since the second-apex is a bit far in so take a relatively wide line around. This is an example of where an in-out-in line is actually fastest. Once the car is pointing towards the exit step on the gas. A straight-lined exit should be the goal here. You should be hugging the inside as you exit at full throttle. Head straight down and prepare for another one of the most difficult corners on the track. For starters, you should consider this bend and the next corner to be one single corner. Adding to that, you should consider this section as one very big double-apex corner. 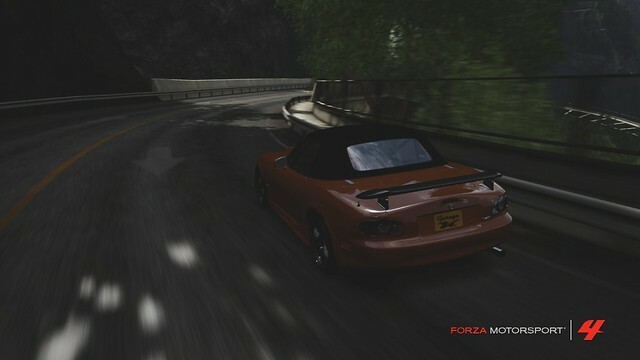 You are going to be diving into the turn from the right lane at full throttle. You want to be sticking close to the guardrail on your right to give you as much space as possible. THIS is where you want to be for this corner. Come up right next to the guardrail without letting go of the gas. Now here's the tricky part, you don't have to brake here either. The corner ahead is fairly steep and medium speed but the width of the road expands from two lanes to three lanes on the exit. The key here is maintaining traction. 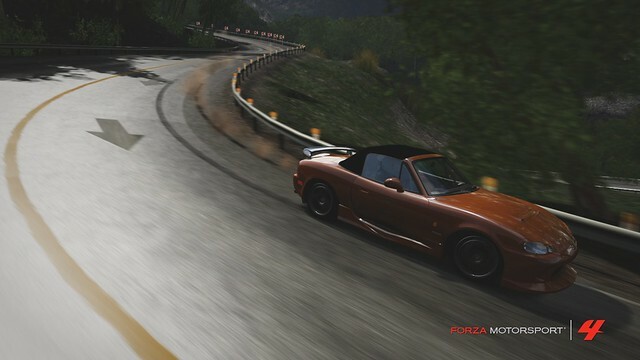 It is superbly easy to lose control of the car, go into a drift, and ruin your lap. It is just as easy to turn in too early or late as well. In essence, timing is everything. 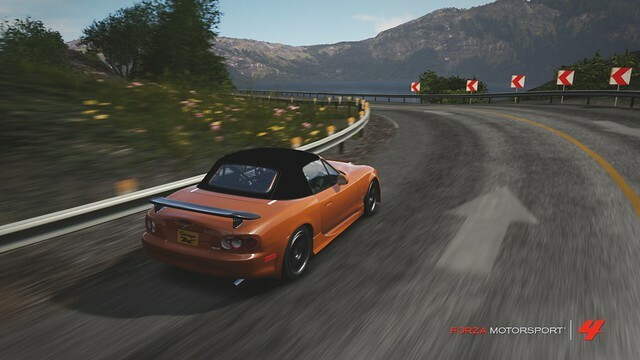 If you lift off the throttle just enough AND you steer in at the correct time, then this next corner can decide whether this run will be rewriting your best time or not. Let off the throttle and turn in, do your best to keep all four tires gripping. Once the car is aimed at the entrance of the tunnel begin flooring it. How much throttle and how soon you can apply it depends on the speeds and the car. You want to use as much space as you can and veer the car all the way to the edge of the wall. Do that and you'll be able to go full throttle all the way to the exit. Remember, you want to maximize your exit speed here because of there's a short straightaway up ahead. Beware however, hitting the wall is a guaranteed way of ruining your run so be brave but also cautious. Now that the turn was cleared, there's no way another hard corner is coming up right? WRONG. 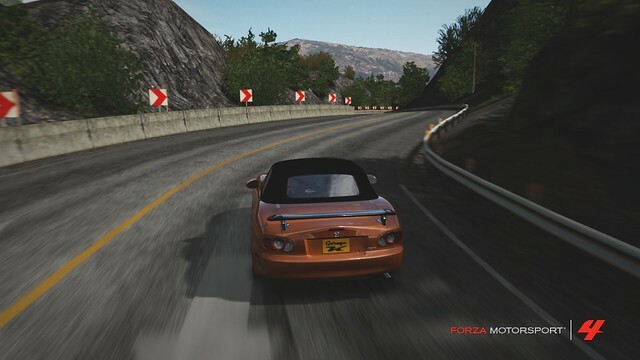 Prepare yourself because this corner up ahead is a reverse-banked 80mph left-hander with NO room for mistakes. 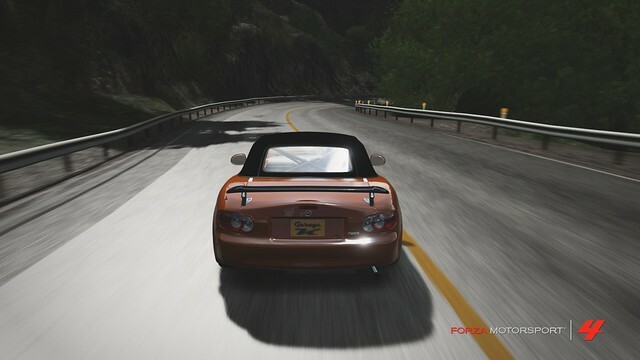 Stick close to the guardrail on the right and try to find your braking point. 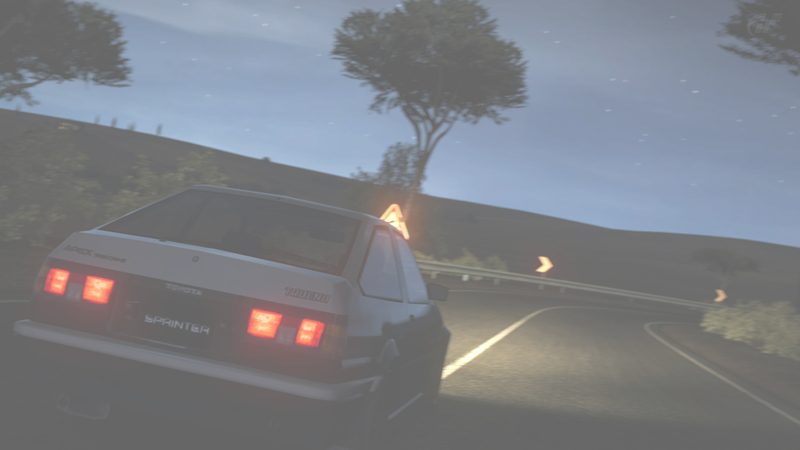 This will be a test of your sense of speed as well as your skills in precision driving. 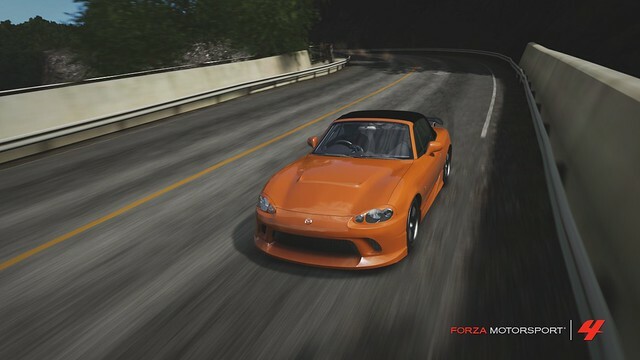 The apex is very difficult to hit because of the high speeds so you will need to balance out a slow enough entry speed to hit the apex and not understeer into the guardrail on the outside BUT a fast enough entry speed to keep up a high average speed and not slow down your pace. Do not let your car slide here, keep all four tires gripping and aim for the kink. Lightly brake before crossing the shadows on the asphalt and turn in. 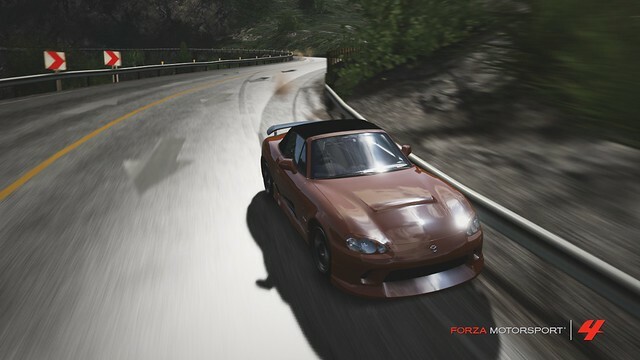 The elevation of the corner drops midway through so your car will lift off the road a bit. If you oversped into it then this is what will cause you to lose grip and crash. If you kept your car under control then at this point you should be able to floor the gas. Beware, getting back on the throttle too early can cause you to hit the guardrail on the exit. This is why a precise sense of speed is required for this entire corner. Make sure to use all of the road and I mean ALL of it. 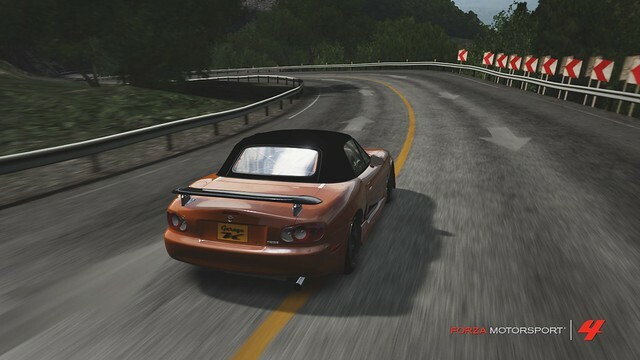 This spot right here is responsible for more dirty laps than any other place on Fujimi Kaido. If done right, your exit speed should be around 90mph! I am working on Stage B-Reverse right now and it should be ready by the end of this week. I hope this guide will come in handy for you guys. I am trying to be as detailed as possible with both my observations from experience and observations from other drivers' lines. I started posting the guide at the top (that much is all I had time for now). Let me know if I should add in other stuff as I go along. I think this is a productive idea, I wanted to do something similar but being the only FWD it wouldn't work. The only thing Id say to add to your guides effectiveness is draw lines in your pics to further show exit/apex lines, just in case. But good work so far! Whoa I can swear that's the exact line I take. Now I'm just waiting for Stage A reverse. I'm losing too much momentum in the exits, probably because of my botched entries. If I'm driving too slow then that means you're driving too fast. Wait, wut? 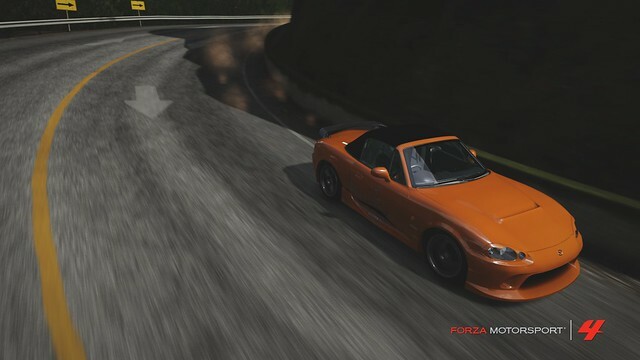 I like your analaysis of banking and steepness of corners, I seem to have unconsciously picked up on a few things like the reverse banking on turn 10 without ever actually thinking about it, but now that i'm reading it I understand why I take the line I do on that corner. I can see this being ridiculously helpful to newcomers...might want to think about a sticky. I think I outdid myself this time for Turn 11 I tried doing something different and added a step-by-step process on the best way to take this corner. I might be doing it again later on for two sections in Stage A-Reverse that have a certain "technique" to them also. I would like to apologize to you guys. I said that I would cover all of the New Downhill by the end of this week but that won't be possible because I don't have much free time anymore. However, I WILL be updating this guideline from time to time so please stay tuned. Sticky approved, this guide looks very helpful. Thank you so much Smooth! When kraze edited me out of his post.. I'm sorry I've been busy with school and stuff so I hardly have time to race online, let alone update this thread. But you're right, this needs to be continued! It's a LOT more time consuming than I expected but if I get at it again I think I can cover the rest of B-Reverse by... next week? Then I'll get started on A-Reverse. Anyways if you REALLY want to improve your line the easiest way is to watch the replay of someone who is faster than you and note what they do different from you. Also, anything I write on this guide is already common knowledge to every teacher in the Touge School so if you have a teacher already you can ask him for line advice while I'm updating this. OK I reviewed what I had posted already and slightly modified some turns, Turn 11 is almost completely changed now. I will begin adding Turns 17 and onward tomorrow. 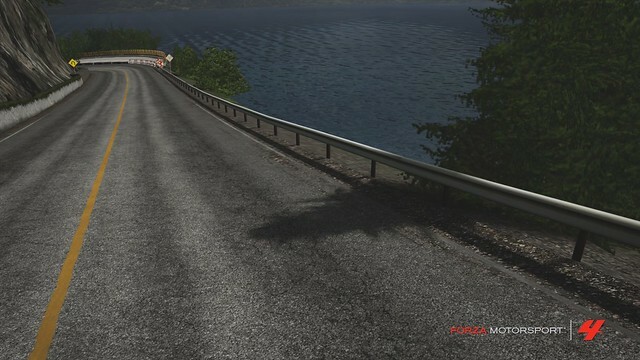 After the entire New Downhill is covered I will try to update the photos with clearer ones (they look darker than I remember) and begin a New Hillclimb guide starting with Stage A. 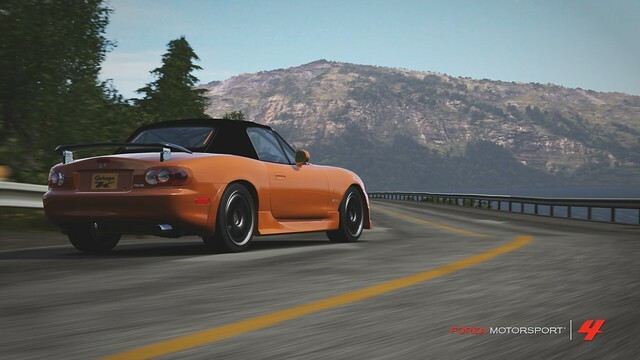 It feels like you get a boost of speed if you hit the road right. I love it too. Turns 16-19 updated on the OP. Turn 19 with no brake?! Ill have to try that, I always just stab the brake and rotate in then throttle it out. There's a lot of places I'm learning that I don't need to brake at all and those are the corners in slowly but surely cutting my time down(one .001 at a time!). I tried watching a couple replays and was amazed at kona's 31 lap. I couldn't believe my eyes when I saw him grab the e-brake!! !